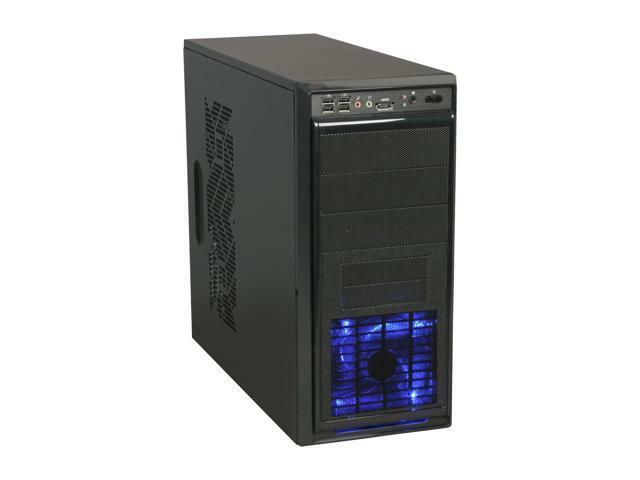 The Rosewill Blackbone Mid Tower Computer Case offers all features that DIY builders value the most at a very affordable price, including roomy internal space, impressive cooling capability, great expandability, cable management design and more. 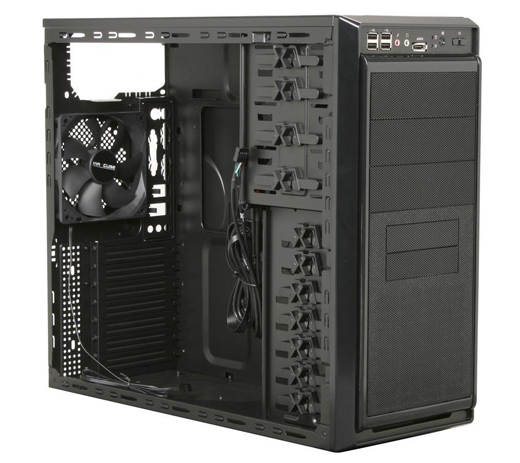 The Rosewill Blackbone supports up to five fans for optimum cooling performance. The front mesh panel, along with air vents, provides extra airflow for maximum breathability. What’s more, it features an easy-to-access CPU cooler installation window. This means you can effortlessly install a liquid cooler in the system without disassembling the whole system, helping effectively cool down your hottest component - the CPU. With roomy interior space, the mid-tower computer case gives you great flexibility to build your system. 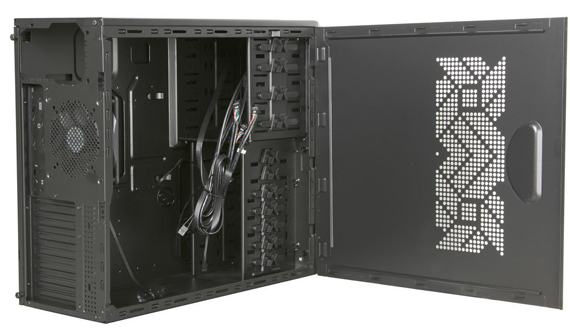 It fits ATX standard motherboards and power supplies, and can accommodate graphics cards of up to 11.5" in length. It offers two external 3.5”drive bays and up to five internal 3.5”drive bays, giving you an easy solution to upgrade your computer’s performance and expand its storage space. It’ also furnished with two 5.25" external drive bays to fit 5.25” optical drives. And, the tool less design for drive bays enables easy and quick installation. Additionally, up to seven expansion slots provide flexibility for multiple graphics cards solutions. The easy-to-access I/O panel is conveniently placed at the top of the front panel, and features four USB 2.0 ports, one e-SATA interface, and audio In/Out ports for easy connection to your peripherals. 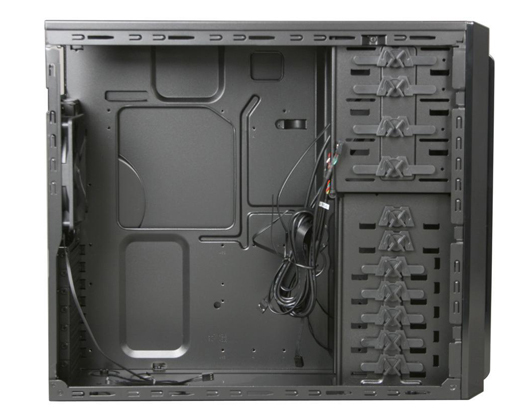 The cable management design creates a neat inner look and enhanced, smooth airflow. 16.06" x 7.28" x 18.50"
Cons: - 1 of the 3 I ordered has a sticky power button that prevents pc from coming on. Swapped plug reset switch and am using that now. - Doesn't have a spot for SSD's to mount....at least I couldn't find it...an adapter tray was only $3 though. - 1 of 3 was dropped during shipping and smashed one the thumb screws for slide the left panel deep into the case. Thanks to some sturdy materials though I simply bent it back into place with pliers and the screw backs out as normal with no damage to threads. Other Thoughts: Would totally recommend this case for a new build. The PSU is top mount in this one, no issues fitting a and supporting a standard sized PSU. The one I used was a Thermaltake Smart 700W (model PS-SPD-0700NPCWUS-W) if you want to pull the specs for measurements. Other Thoughts: think this is bullfeces for newegg to require all these different comments. I've read a few more recent reviews about the front fans not lighting up and/or the case missing its hardware kit. Both of my cases included the hardware kit, and the one front fan I tested lit up red. The other is untested (the nature of our work requires that I replace the front fans with non-illuminating fans). The design of the power button on these cases has always been suspect...they sometimes hang up and have to be fiddled with. On both of these new cases I found the metal that the actual switch attaches to bent forward, causing the switch to make permanent contact with the power button (ie: it was acting like the power button was constantly being pressed). I had to remove the front bezel and bend the metal back so the power button would work normally. A little sloppy manufacturing on somebody's part. At the current price is $49.99 I think this case is now overpriced...$35-$40 is a fair price I think. Cons: Bad faith, misrepresented of facts: No blue fan (Black), No installation hardware and speaker. I have purchased three all junk and not worthy of the quality of Newegg. Someone has pulled a fast one here. It's Junk DO NOT BUY IT!!! Other Thoughts: COULD NOT RECOMENT THIS PRODUCT!!! I am so sorry for the inconvenience. The problem you have experienced is most likely due to a rare defective Blackbone. Please contact us with an electronic copy of order invoice and we can further assist you with a replacement of Blackbone case under 1 year warranty coverage. We look forward to your reply. I am so sorry for the inconvenience. Please rest assured that we can send the front panel and accessory kit together for you at our cost. Please contact us with an electronic copy of order invoice and we will further check that for you. We will look forward to your reply. Pros: Plenty of drive bays with front fan to keep them cool. Cons: Case WAS MISSING the screws, stand offs and other accessories that were supposed to be included. I would have been very upset if I did not have spares parts from prior builds. Before anyone suggests that I may have overlooked them, no I did not. I checked every inch of the case and shipping box and they were not there. Not really an issue for me but the front case fan is not an LED fan. It does not light up. Other Thoughts: After looking at dozens of cases online, this case was the perfect match for my needs at a very attractive price. I reduced my rating because of the missing parts. I purchased this from the NewEgg store on another site so this review may not show I am a verified purchaser. Pros: A simple case, with easy to use HDD mounts/cages. Open PSU mount, makes the case look a bit messy with wiring but you can't see inside it anyway. Comes with two installed case fans, which seems to be more than some cases these days. Four USB ports! I enjoy having the extra front ports so this was a big bonus. Fairly light and easy to carry--this was great since I would take it home from college when I was on breaks. Cons: Case USB ports a bit close together; couldn't plug certain things in next to each other. Front headphone/mic jack has always made a buzzing noise when trying to use it, so I just plug directly into the MB. Not really a con I guess, unless you really want to use the front ports. Gets a bit dusty on the inside, but dusting it every once in a while isn't such a big deal for me. Other Thoughts: I've had this case for three years (got it in summer 2015). It's a bit simple, but it gives you enough room to work in and gets the job done. Definitely a good starter case! Cons: Case arrived with a small dent in the top corner where the main side panel attaches. I was able to get the dent out by gently hitting the side with a hammer and a block of wood, I wish they would package the case better. The rear fan mount is next to useless, unless you remove the grill there will be next to no airflow. Your best bet is to rely on the side fan or the power supply for exhaust.